Harry Potter has been a big part of my life for eight years now, ever since a friend introduced me to the phenomenon by giving me a copy of the Sorcerer’s Stone book. I was instantly hooked. I read that book, re-read, re-re-read it, so on and so forth. I loved the second book just as much, and the third didn’t disappoint. I remember waiting on my driveway for hours on a Saturday waiting for the mailman to deliver me my copy of the Goblet of Fire book, and I reminisce happily about waking up at 4 am to go get the Order of the Phoenix book when it came out, reading the 900-page beast in 2 days. 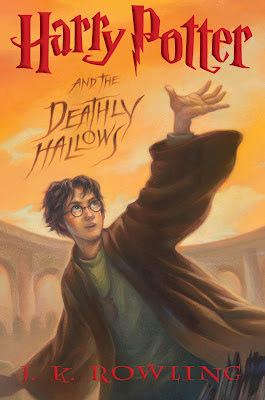 I scaled Half-Blood Prince in a day and a half, and I’ve probably never been as excited for anything in my life as I was the release of the final book in J.K. Rowling’s brilliant and legendary series, Harry Potter and the Deathly Hallows. Having finished the book on Sunday, it’s taken me a while to get a review written. Rowling has crafted an extraordinary and entirely brilliant finale to the series, that contains some of the best moments she’s yet written, and the book was so overwhelming, it’s taken me a few days to organize my thoughts. The book picks up a few weeks after the conclusion to Half-Blood Prince. The situation is dire; with Dumbledore dead, Voldemort has begun to move in on the Wizarding world in ways he never has before. The book begins with a brilliant action sequence as the Order of the Phoenix moves Harry from the Dursley’s house to a safe location. It’s a bloody opening to a book that is simply drenched in death and misfortune, but through it all, Harry, Ron and Hermione persevere for the sake of the world and people they love. Most of the book describes the trio’s quest to find and destroy Voldemort’s Horcruxes, objects that contain fragments of his splintered soul, all leading up to a conclusion that will leave you breathless. Rowling has firmly cemented her place in history as one of the best authors who ever lived, this 7-part epic proof of that. The book is full of references to Potter’s previous adventures, with Harry and co. visiting many places and finding out many secrets only glimpsed before now. Rowling has repeatedly stated that she had this whole series planned out from the beginning, and if you didn’t believe that before now, you most certainly will when reading this book. She closes (almost) every loose end and reveals secrets about things we thought mundane. In Potter’s world, even the most ordinary of objects, even the most un-remarkable event can, in the end, make all the difference. If you don’t understand what I mean now, read the book and you will. One thing that should be noted is that this adventure is very different from Potter’s first six outings. While the blood-soaked finale takes place at Hogwarts, the rest of the book is spent adventuring the rest of the Wizarding world. The lack of classes and such is a little disconcerting at first, but you quickly get used to it. The lack of Hogwarts as the main setting also means much the supporting cast we’ve come to love is absent for a great deal of the novel. But the story is so well thought out that you find you don’t miss them. My only real complaint about the novel is that in the middle of the book, for about 100 pages, the book seems to ramble aimlessly; I think Rowling’s editors should have compressed this part more, as it slows down the action a bit too much. Other than that, this is an all around perfect book, like Rowling’s other Potter novels. You will laugh, cheer, and in many instances, cry reading the finale to what is, in my humble opinion, the greatest literary work since Tolkien sat down one morning and wrote “In a hole in the ground, there lived a hobbit.” I’ve spent a great deal of my time escaping into the world of Harry Potter, reading each book over no less that 20-some-odd times, and I can’t tell you how gratifying a conclusion “Deathly Hallows” is. It’s sad that I will never again open an unread Potter novel, but nonetheless, I feel so happy to finally know how it ends. Thank you, J.K. Rowling, for creating a cast of characters that have gotten inside our minds and hearts so immensely. There’s a moment in Deathly Hallows when Harry visits his parents graves and weeps for them, and it’s a mark of how well-developed a character Harry is that you’ll find yourself crying alongside him without even being conscious of it. We care about these characters, and as such, we care about where they end up, and Deathly Hallows reveals all. I wish all conclusions could be this satisfying.